Artist Bailey Bob Bailey: As fate would have it I’ve been dealing a lot lately with my aging father and dog, the poem felt like a television episode I’d been living. Poet Robin Becker: I hoped an artist would find a way to integrate the human and canine imagery I conjure. Artist Bailey Bob Bailey: My impetus in the poem was straight forward image. I’ve been working with street signs and wanted to pursue a public art that became more than explanatory, something more open ended, even exploratory. Poet Robin Becker: Yes, Bailey used repeating design elements in a way I hadn’t envisioned! And then, by doubling the image and turning it upside down, he emphasized a sense of fracture within wholeness. Artist Bailey Bob Bailey: It reminded me how similar life’s experiences are and how specific a universal moment can feel. 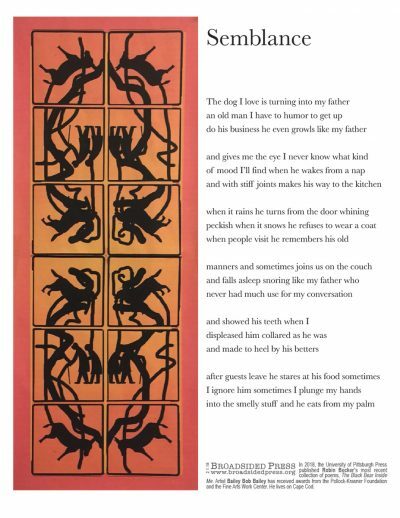 Poet Robin Becker: Looking at both visual depictions of my poem, I’m amazed at how words invite people to “see.” The single image of the curled dog conveys containment of the “many” inside the singular. The twelve-paneled, silhouetted “window” routes characters and feelings in a living continuum. 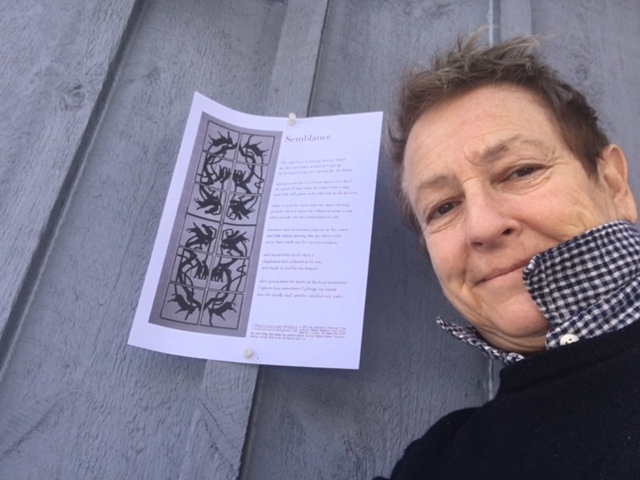 In looking at the poem and the two visual responses together, what connections or associations rise to the surface? Poet Robin Becker: I’m struck by the rich response we all have to bodies: human, canine, otherwise. Poet Robin Becker: Yes, I’ve written poems in responses to paintings, photographs, drawings, and prints. Artist Bailey Bob Bailey: “Lily-0″ by Sam Amidon, mainly how it builds and narrates… also, because I can’t help becoming transfixed. Poet Robin Becker: Bach’s Partita for Solo Violin in D Minor. Poet Robin Becker: I just read all of Kent Haruf’s novels. I read Andre Acimann’s Call Me By Your Name after I saw the film. And now I’m reading Jane Mayer’s Dark Money and Stephen Mitchell’s Can Love Last? Artist Bailey Bob Bailey: ANTIGO NICK (Sophokles) translated by Anne Carson. Artist Bailey Bob Bailey: Just finished a world wind tour of Europe, it would probably be a Veronese of some sort. Poet Robin Becker: Rothko at the MFA in Boston. Poet Robin Becker: Thank you, Liz, and other Broadsiders, for this inventive approach to sharing the literary and visual arts. Artist Bailey Bob Bailey studied sculpture at Virginia Commonwealth University. 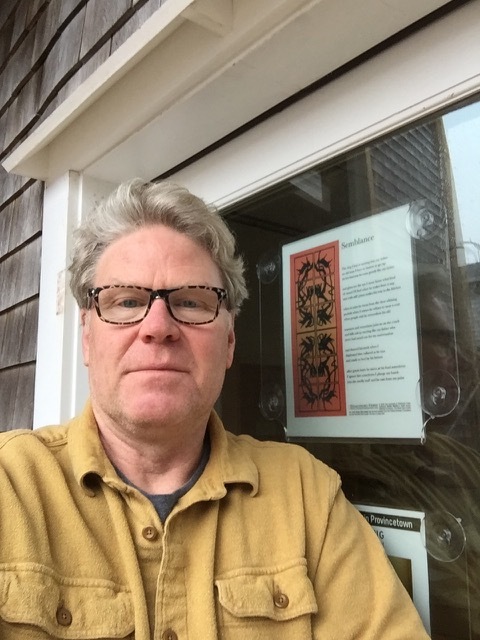 He recently had a survey exhibition at the Provincetown Art Association and Museum titled CAVE ORE BRIDGE. Bailey is represented by Ethan Cohan Gallery in NYC and Beacon, NY and at The Schoolhouse Gallery in Provincetown, MA. He lives year round in Truro, MA. Poet Robin Becker’s books in the Pitt Poetry Series include The Black Bear Inside Me, Tiger Heron, Domain of Perfect Affection, The Horse Fair, All-American Girl and Giacometti’s Dog. Becker has received fellowships from the Bunting Institute at Harvard, the Massachusetts Cultural Council, and the National Endowment for the Arts. The Women’s Review of Books publishes her poetry column, “Field Notes.” Recent poems have appeared in The American Poetry Review and The New Yorker. The poet vectorizes against barn in Boalsburg, PA. Artist Bailey Bob Bailey posts his collaboration at the Fine Arts Work Center in Provincetown.